This is a parent’s worst nightmare and it is often compounded by the next words from the doctor’s mouth. “He will have cerebral palsy. This means he probably will not walk, talk or attend a normal school. We will have to wait and see how bad it will be.” If you were told this in the difficult early days, it is almost impossible to get rid of it. It lurks about at the back of your consciousness and even years later, many parents are still waiting for the proverbial shoe to drop. The big question persists. How bad will it be? So, take a big breath and relax. This is an outdated, incorrect statement. The boy with the extensive brain damage shown in the image, did develop cerebral palsy, but it was mild. GMFCS I. There have been big changes in the cerebral palsy world over the past 20 years or so. The first change is the growing awareness of neuroplasticity – the ability of the brain to regrow, repair, reorganize and reallocate resources to create function. read…Real or False Hope after Early Brain Damage? Once the regenerative ability of the brain is recognized, then new approaches and treatments are possible. We now know that neuroplasticity is stimulated by novel, challenging tasks with consequences. Great news…but it comes with a catch. It demands a major change in the mindset of doctors, therapists and educators in the CP world. It really demands a shakeup of their worldview. I hope that parents everywhere are encouraged to talk about my book and even consider it as a great holiday present for their healthcare team. 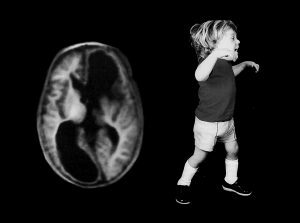 The Boy Who Could Run But Not Walk: Understanding Neuroplasticity in the Child’s Brain , is the story of the long road to my own mindset change from thinking that the only option was to prevent baby brain injury to the new mindset of challenging the negative prognosis with innovative approaches and treatments. Dr Dweck’s book, Mindset, is another of the must read books in my parent survival kit. I have a question for you. Were you given a similar dismal prognosis? If yes, I would love to hear your story on my Facebook group. We couldn’t understand that given adult stroke victims who recover so well. Finally, you have answered that question. Thank you! We immediately sought and found a physical therapist who understands gait training. I gave her a copy of your book. Turns out, she once attended one if your courses on EStim! Thanks so much for your book and sharing your research. We are telling every healthcare member about your book. Thank you for your uplifting message.I am pleased things are going well.Norman Doidge’s first book, the Brain That Changes Itself, changed the world of adult stroke rehabilitation as the families and general public learned more about adult neuroplasticity. My hope is that my book will work a similar miracle for CP rehabilitation.Thank you for spreading the word. We were given graciously the news that in time the diagnosis of cerebral palsy will most likely be the case. Our docs have always waited for us to ask questions rather than telling us how its going to be. What’s been hard is explaining things like tone and how the CP manifests in an infant (even in the eye muscles) to my mother who is always so proud of my daughters physical “strength”. You might share your copy of my book with your mother…it is helpful for grandparents to learn more about the condition. Our son is 8 years old. He had breathing problems after birth and was in NICU for 6 weeks with many apneas. When he was 3 days old, a doctor told us that he would never be able to feed orally – that was so discouraging to hear! He was wrong! Soon after birth he was diagnosed with Muenke syndrome (with cranio-synostosis, and he’s never had surgery for that since it would have purely been for cosmetic reason), severe hypotonia, and a few other things. Within the last 1.5 years, he was diagnosed with severe growth hormone deficiency, Autism Spectrum disorder, intellectual disability and Prader-Willi Syndrome (which impacts the brain). 14 months ago our family went to IAHP (www.iahp.org) re: neuroplasticity and to have them assess our son and design a program for us to do with him, and since then we’ve had him home full-time to work on as much of that program with him as we can. He had taken JK and SK (1 year behind his age) prior to that, in a private school, with a 1-on-1 EA/PSW. We’re currently planning to continue our neuroplasticity therapy with him for at least another 1-2 years (based on IAHP, although we may research/apply other neuroplasticity things for him as well). When we started neuroplasticity therapy, we stopped SLP, but we’ve done some PT. We’ve never done ABA (behaviour therapy) with him and don’t currently plan to, since we want to heal his brain (the root cause) rather than try to just treat symptoms. When our son was much younger, we didn’t know if he would ever be able to walk. Our son wears SMO’s and shoes most of the time (including in our home) and he can run on flat surfaces with his SMO’s and shoes and he can walk up and down stairs while holding a railing! Our son loves to read! And he loves music and sings incredibly well! Good to read your story.Now that he is up and moving, it is worth seeing a good therapist to see if any of his aids need upgrading. I would also ask about compressive garments may help with the low tone of his P-W diagnosis. It is always hard when the child has multiple diagnoses. Where do we start? I have a grandson with CP and we live in Iowa. I would read my book and share it with your healthcare team. You could also join my Facebook Group and read the input from other parents and grandparents. Most Early Intervention programs are treating a child for “Developmental Delay”. I think the advice you are being given is helpful for his cognitive development, but you should ask your physicians for a diagnosis of his motor delays, mostly like a form a form cerebral palsy, and get some lesion specific therapy from a physical therapist. Waiting for a firm diagnosis makes no sense to me. If they say it is too early to be sure, get a label of “at risk of cerebral palsy”. The important part is getting the PT who knows what to do working with you. Hard to tell without an examination. I would ask your md’s. Hi both, sorry to hijack your conversation but I think I have something to add. My daughter has CP GMFCSIV and was written off by NHS at 2, saying this is the best she’s going to be. We went to a school for conductive education. In the 12 months she’s been there she’s changed beyond recognition. She speaks like a 3 year old from nothing, she weight bears from nothing. She sits with a little support from nothing. The conductors are obsessed with meuroplasticity and repeating a good movement to get those cells to grow round that impulse. It works. Don’t give up. Sent with love and light.